For a long time in my collecting career I looked at "Through-The-Mail"/"In Person" autographs with disdain and instead favored "Certified" autographs put out by the major card companies. But as I've matured as a collector I've come to appreciate that some of the players that intrigue me most are never going to have a "Certified" autograph from Topps or Panini. Barty Smith is such a player. 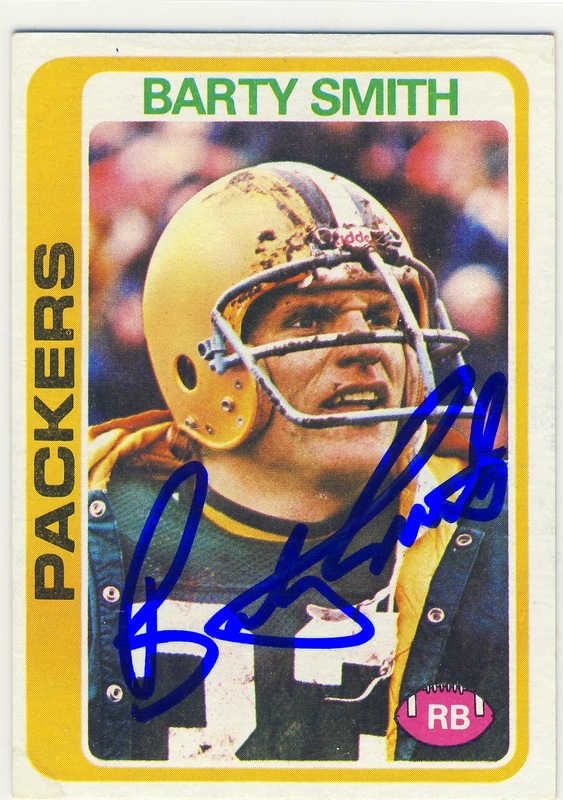 He was was the leader of the Packers running attack on those mid-to-late 70's teams when the Pack struggled to get to .500. That blue signature is almost neon blue. That's a great looking card/signature. As an autograph collector, I've never cared for certified autographs. Any that I've pulled from packs were immediately sold. I'm much more interested in getting autographs in person. Signed or not that's a great football card. I've picked up 'certified' type autographs but the few that I have gotten in person mean the most to me.